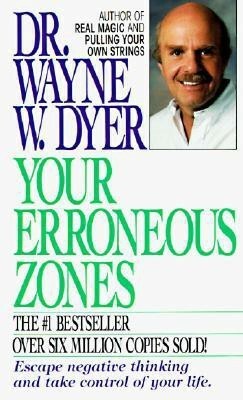 Your Erroneous Zones is the first self help book written by Dyer and it is one of the top selling books of all time with an unbelievable 35 million copies sold since its publication in 1976. Dyer expounds his observations on these erroneous zones with clear and irrefutable logic. Summary Of The Book A positively infectious book with ample advice on life and the choices involved in living a good life, Dyer provided a perceptive and indulgent little book. Your Erroneous Zones triumphs in expounding the brazen destructive force of negative thinking and urges readers into following the opposite by providing refreshing insight into daily trifles. Whether it’s love, guilt, obsession or controversy, Dyer paints a unique picture for the readers, which is both immersive and enthralling in its use of analogy and intuition. Flouting the thoughts of the current culture that the generation philanders to, Your Erroneous Zones tries its best to challenge its readers into thinking about the less travelled path. The beauty lies in the structure of the book, where the premise stems from an intrinsic truth about learning and controlling every person’s mind to exacting the promise of a better future. The present is the greatest gift that Dyer gives to his readers and through the book surmises the power of living in the moment. The difficulty of finding out and replacing negativity with positivity is dealt with care and precision through the chapters of the book. The author also talks about not procrastinating. The use of the negative strain of thought as a ‘pattern’ is an inventive plot contrived by the author and he urges readers into recognizing these patterns. In doing so, the readers are given the tools needed to weed out the same and in turn, be able to shut out the associated negative thoughts that finally control the manner in which people approach their lifestyle. The book has been a great hit since its launch in 1976 and has sold over 35 million books to become one of the best selling books ever. About Wayne W. Dyer Wayne Walter Dyer is an acclaimed American self-help author and motivational speaker. His other books include Change Your Thoughts – Change Your Life and Living The Wisdom of the Tao. After endorsing the tag of spirituality into his message, he wrote the books The Golden Collection and Your Sacred Self among others. He was born in Detroit, Michigan. After graduating from Denby High School, he served in the United States Navy for 4 years. He returned and received his D.Ed. degree in Counseling from Wayne State University. He was a Professor and guidance counselor at St. Johns University. He wrote Your Erroneous Zones on the insistence of a literary agent and quit his teaching job to take up self-help as his calling. He is a celebrated proponent of positive thinking and has made several national TV appearances including The Tonight Show and Merv Griffin.